Take Exit 447 from I-90. Turn right onto South Billings Boulevard. (You'll be heading north.) Go .7 mile on South Billings Boulevard. Watch for our sign. Take Exit 447 from I-90. 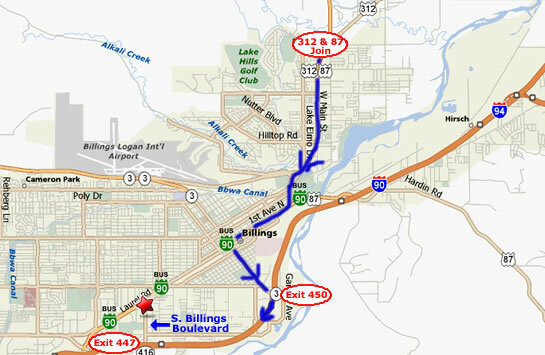 Turn left onto South Billings Boulevard. (You'll be heading north.) Go .7 mile on South Billings Boulevard. Watch for our sign. Turn right onto 27th Street. Continue south for 3.1 miles to I-90, Exit 450 west. Proceed west on I-90 for 3 miles to Exit 447. Turn right onto South Billings Boulevard. (You'll be heading north.) Go .7 mile on South Billings Boulevard. Watch for our sign. Right at Main. Go 3.5 miles. Turn right at 1st Avenue North. Go 1.03 miles on 1st Avenue North. Turn left at 27th Street. Go 1.5 miles south to I-90 Exit 450 west. Turn right onto I-90. Proceed west on I-90 for 3 miles to Exit 447. Turn right onto South Billings Boulevard. (You'll be heading north.) Go .7 mile on South Billings Boulevard. Watch for our sign.